Preventive treatment can be most effective for individuals with prediabetes, and RDs are in a unique position to play an important role in prediabetes management. By better understanding this condition and the evidence-based diet and lifestyle modifications that improve blood glucose regulation, RDs can have a major influence on diabetes prevention in this country. This continuing education course reviews the diagnostic criteria and health risks associated with prediabetes. It also examines the current research on treatment and prevention strategies including diet interventions, lifestyle modifications, dietary supplements, and prescription medications. 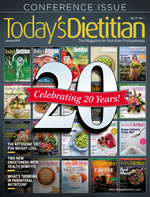 In addition, RDs' important role in educating patients with prediabetes is highlighted. The goals of prediabetes assessment and diagnosis are to catch patients who are early on the path toward diabetes and prevent the disease from developing as well as avoid the associated comorbidities, which often are the most harmful and costly conditions. To that end, the glucose ranges are set lower than those that define the criteria for type 2 diabetes. The ADA considers impaired fasting glucose (IFG) higher than 125 or an HbA1c higher than 6.5% as parameters for a diagnosis of type 2 diabetes. Researchers have noted that it's important to look at several blood glucose parameters when assessing prediabetes. As with all diagnostic strategies, there are strengths and weaknesses with each of these tools, and diagnoses have been missed by relying on one measurement alone.9 Checking fasting blood glucose often is the first and easiest test to perform, but it can miss day-to-day irregularities. This measurement also requires a proper fasting period during which the patient may or may not have been entirely compliant. HbA1c, as a three-month average of blood glucose, tends to be more predictive of blood glucose abnormalities and has the advantage of not requiring fasting; however, it can be influenced by other health conditions and therefore might be unreliable in certain circumstances. Some of these conditions include iron deficiency anemia, chronic kidney disease, and hemoglobinopathies.8 IGT is the most consistently predictive method, has been used for assessment in most major diabetes prevention trials, and is the preferred method for the WHO.9 However, because this test requires more time and energy, it's not as commonly employed in public health settings as is the HbA1c and fasting blood glucose tests. Unlike with diabetes, which has been more extensively studied, there are currently no published clinical guidelines for preventing and treating prediabetes. While the need for more studies to establish these guidelines has been acknowledged,7 there are evidence-based prevention and treatment strategies based on current studies RDs can use when working with patients with prediabetes. There's research to support the efficacy of lifestyle changes (eg, diet, exercise, weight loss, medications, and supplements) to reverse prediabetes. Studies investigating the impact of lifestyle changes on blood glucose regulation show that diet is a critical component of prediabetes treatment and prevention. Diet prescriptions for prediabetes often are similar to those for diabetes in terms of macronutrients; however, the guidelines are more flexible since there are no set criteria for diet recommendations. The recommendation for carbohydrates, according to the updated ADA guidelines, is that the overall amount be reduced, regardless of type. Healthful carbohydrates obviously are preferred, including foods such as fruits, legumes, whole grains, and dairy, but it appears addressing the quantity at each meal is the main concern in reducing postprandial glucose.15 Using the glycemic index (GI) to guide preferred carbohydrate choices has been popular in diet education; however, studies have shown that consumption of lower-GI foods doesn't necessarily produce a slower blood glucose response.16 In addition, more recent studies have shown variability in GI response to certain carbohydrate foods among individuals, indicating the GI may need to be individualized if used to guide food choices. It's theorized that an individual's microbiome could influence carbohydrate metabolism, but that has yet to be proven.17 Total glycemic load at each meal is important to consider, with studies showing this is more indicative of blood glucose response than is that revealed by looking solely at individual foods.18 Overall carbohydrate reduction, with a focus on high fiber intake and tighter glycemic control, is therefore recommended. The percentage of protein intake in terms of calories also should be individualized per patients' needs. Based on reviews of studies, the ADA concluded there's no one ideal protein level that can apply across the board that will best promote optimal blood glucose levels. While most people with diabetes tend to eat about 16% to 18% of their calories from protein, the amount will vary based on metabolism and overall energy needs.18 A variety of foods at each meal is ideal, with protein clearly being an important part of that mix. Many diets recommended by health care practitioners for diabetes and prediabetes seek to optimize a variety of healthful choices to improve glycemic control. Some of these plans, which inherently provide a mix of macronutrients via whole food choices, have been shown to be effective in combating prediabetes. The Mediterranean diet has been well studied and features prominently in diabetes research. It frequently has been shown to reduce CVD risk and improve glycemic control.18 Studies have shown it can help prevent diabetes, even when weight loss isn't a part of the intervention.22 This type of eating plan encourages increased consumption of plant-based foods, healthful fats (especially nuts and olive oil), lean meats (especially fish), and whole grain carbohydrates. Sugar and processed foods are kept to a minimum. Vegan and vegetarian diets also have been studied. While eschewing animal products, they tend to focus on a host of antioxidant-rich plant sources and high-fiber choices. Research has shown these diets can be quite effective in decreasing the risk of prediabetes and progression to type 2 diabetes, especially when combined with weight loss in subjects with diabetes.23 There's limited evidence on their effectiveness with prediabetes, although it can be extrapolated that it may be helpful if weight loss is concurrently achieved.18 If practiced unhealthfully, however, vegan and vegetarian diets run the risk of worsening blood glucose in prediabetes patients. One must be particularly vigilant to limit sugar and refined grains and make sure there's consumption of adequate protein sources spread throughout the day. Another popular eating approach is the low-carbohydrate diet. It's postulated that by limiting carbohydrates, the main contributors to elevated blood glucose, glycemic control can be more easily achieved. A 2014 study showed favorable results when putting a group of people with prediabetes on a low-carb plan that involved intense education and follow-ups every three months over a 12-month period. They found that 69.4% of the patients using a low-carb diet were able to normalize their blood glucose levels within that 12-month time frame. The participants lost weight during the study, which may be a key contributor to their success.25 A drawback to the low-carbohydrate diet is that there's no standard definition of "low carbohydrate." The latter study, for example, reduced carbohydrate intake to 30% of calories. Another recent study looked at a ketogenic diet, a severely carbohydrate-restricted diet that induces ketosis. It, too, showed promising benefits for blood glucose normalization and enabled participants to lose weight.26 With low-carb plans such as these, it can be hard to tease out whether the diet or simply the weight loss is the key driver of improved glycemic control and to determine what carbohydrate level is ideal. Compliance also is an issue, as a lower-carbohydrate lifestyle may be difficult to maintain in the long term. From the research, it's clear that there isn't one set prescription for macronutrient percentages across the board for patients with prediabetes. This overarching factor highlights the need for a diet that includes a variety of healthful, whole food choices and is tailored to the patient's food preferences and cultural norms.15 The key is to find an individualized plan that improves glycemic control in the patient and can be maintained for the long term. Bariatric surgery is known to help improve glycemic control. The Swedish Obese Subjects study showed a 75% decreased risk of diabetes compared with controls when using bariatric surgery to achieve weight loss.7 There's less evidence for its efficacy, specifically with prediabetes; however, some assumptions can be made. For example, a recent study looked at when bariatric surgery should be considered, given that the further someone progresses with diabetes, the harder it is to treat. Researchers concluded that surgery, when used early in disease progression, gives the best chance for preventing or reversing diabetes.28 Moreover, gastric bypass surgery has been shown to decrease inflammatory markers.29 Inflammation is linked to insulin resistance,30 so reducing inflammation is another way surgery decreases the risk of progression to diabetes. For obese patients for whom lifestyle modification has been unsuccessful at producing weight loss and improving glycemic control, bariatric surgery is a tool to consider. Few quality studies have looked at exercise independently of other lifestyle factors or discussed the exact type of exercise and duration used to achieve the desired result, but it can be concluded from the DPP and DPS that adhering to the WHO recommendations is useful. Adults aged 18 to 64 should engage in at least 150 minutes of moderate-intensity aerobic activity or 75 minutes of vigorous aerobic activity per week with the addition of strength training at least two days per week.33 This provides a goal to recommend in terms of duration and type. A limitation, however, is that guidelines are rather general, so further studies on exercise are needed to allow clinicians to make more detailed recommendations. In some cases, medications are used to help treat patients with prediabetes. While not always a first-line therapy, they can be helpful when individuals have trouble maintaining lifestyle changes or when such changes don't produce adequate results. Dietitians working with clients who may have difficulty with lifestyle change and/or have a history of GDM can consider referring them back to their primary care providers to discuss the use of metformin. There are numerous vitamins, herbs, and other supplements commonly used to help regulate blood glucose. Their efficacy remains unknown, but there's some evidence of benefit. Described below are a few that show promise, but more research is needed, especially in terms of appropriate dosing and how to safely use them with other treatment options. Omega-3s also have been examined for a potential link to improved glycemic control. A meta-analysis conducted in 2012 concluded there's no significant reduction in risk of type 2 diabetes with intake of omega-3 fatty acids.41 Several studies conducted in 2016 found reduction of progression of nephropathy and retinopathy in people with type 2 diabetes, suggesting improvements to blood flow and arterial health.42,43 For that reason, and because it's known that circulatory problems begin in prediabetes, omega-3s should be recommended as part of a healthful diet, but so far there's no evidence to suggest they help improve glucose regulation. Doses vary for people with diabetes as opposed to those who don't have the disease, as high doses in the latter may be harmful to the pancreas instead of helpful. More research is needed to elucidate safe levels for patients with prediabetes. Given the multitude of diet and lifestyle changes that can have a positive impact on prediabetes, education is clearly critical. Information must be disseminated to clients in a way that induces behavior change. Education is provided in many settings and by various types of educators, including doctors, nurses, health educators, and RDs. Interestingly, studies show there's improved patient compliance and better outcomes when RDs deliver the education; this demonstrates a clear role and an increased need for RDs in preventive medicine. A 2014 study found education administered by an RD was more effective than usual care over a 12-week period in reducing risk factors for progression to diabetes.45 The MNT group, which was provided four intensive MNT visits, experienced a decrease in HbA1c, whereas A1c in the usual care group increased. There was a larger increase in physical activity in the MNT group (from 21% to 95%) while the other group showed only a modest increase (21% to 43%). The overall Diabetes Risk Score also decreased more significantly for the MNT group. The primary disadvantage RDs face in working with patients with prediabetes is insurance coverage. While many plans now cover patient visits for counseling people with prediabetes, Medicare still doesn't recognize prediabetes as a covered condition for nutrition counseling. This places millions of older Americans at increased risk of diabetes if they don't get the education and support to make appropriate lifestyle changes. Effort is being made to secure Medicare coverage, but that hasn't been achieved. Prediabetes is a condition in which blood glucose dysregulation has initiated, putting a person at an increased risk of diabetes and its comorbidities if untreated. Prediabetes is underdiagnosed in the United States, which means many aren't provided with appropriate diet and lifestyle recommendations to improve blood glucose when they have the best chance of being effective. From the literature, it's clear that diet, exercise, and, in some cases, drugs and supplements can be useful in the fight against diabetes. MNT is exceptionally effective in delivering this advice, helping to prevent the progression to diabetes. Issues with insurance coverage remain, so many Americans, especially older patients, aren't receiving the intensive nutrition counseling that results in improved blood glucose management. While clear MNT guidelines are lacking for prediabetes management, the literature suggests there are many approaches that improve glycemic control. The real key is individualization, which is where the counseling and nutrition expertise of RDs are uniquely valuable. By providing education about effective diet and lifestyle change tailored to the patient, RDs are on the front lines of diabetes prevention. — Danielle VenHuizen, MS, RD, CLT, is a Seattle-based dietitian and owner of Food/Sense Nutrition. 1. Define the diagnostic criteria for prediabetes. 2. Assess the key risk factors for prediabetes. 3. Propose appropriate diet and lifestyle recommendations for patients with prediabetes. 4. Counsel patients with prediabetes about the pros and cons of medication and supplement use. 5. Distinguish the role of the RD in prediabetes education. 1. When diagnosing prediabetes, why is it important to look at several different types of blood glucose measurements before making an assessment? a. Each test is susceptible to errors, so looking at more than one measurement helps improve the chances of a correct diagnosis. b. Researchers tend to be more thorough than doctors and so always encourage as much testing as possible. c. The tests have wide margins of error, so it can be hard to make a diagnosis based on one test alone. d. HbA1c levels can vary day to day and therefore shouldn't be the only marker used for diagnosing prediabetes. 2. Which comorbidity often is associated with prediabetes? 3. What's the best diet for a patient with prediabetes? 4. What's a key point about the Mediterranean diet that makes its efficacy in diabetes prevention unique? a. It decreases the risk of prediabetes and diabetes even when weight loss isn't achieved as part of the intervention. b. It drastically cuts more fat and calories than other diet plans do, which achieves greater improvements in blood glucose regulation by promoting weight loss. c. It lowers overall sodium intake, which lowers blood pressure and helps improve blood glucose regulation. d. The emphasis on increased consumption of seafood and omega-3 fatty acids is the key factor that reduces blood glucose levels. 5. What's a limitation of the low-carb diet plan? a. The recommended intake of carbs is still too high to achieve improved blood glucose regulation. b. It causes an increase in overall sodium intake. c. The diet often shifts to high fat intake, which increases the risk of CVD. d. Patients may find it difficult to adhere to the diet. 6. According to the Diabetes Prevention Program study, what's the most important step to take to reduce the risk of prediabetes? 7. Which of the following is a factor that increases risk of prediabetes and diabetes? 8. What's the leading impediment to people with prediabetes seeing an RD for nutrition counseling? a. There may be no RDs in their local areas. b. Medicare doesn't provide insurance coverage for a diagnosis of prediabetes. c. Patients don't find the information useful. d. Patients feel they can get most of the diet information from their doctors. 9. Why is there no standard diet recommendation for people with prediabetes? a. Doctors don't prescribe diet interventions for prediabetes. b. People's bodies all respond differently to various levels of carbohydrate, protein, and fat intake. c. None of the diets studied so far have shown favorable results. d. Most people have trouble following diets, so less emphasis is being placed on strict eating plans. 10. Which of the following foods is a good source of chromium? 1. Statistics about diabetes. American Diabetes Association website. http://www.diabetes.org/diabetes-basics/statistics/. Updated July 19, 2017. 2. Tuso P. Prediabetes and lifestyle modification: time to prevent a preventable disease. Perm J. 2014;18(3):88-93. 3. Bloomgarden ZT. American College of Endocrinology Pre-Diabetes Consensus Conference: part one. Diabetes Care. 2008;31(10):2062-2069. 4. Co-morbidities. National Association of Managed Care Physicians website. http://www.namcp.org/diabetes/html/info/comorbidities.html. Accessed March 22, 2017. 5. The cost of diabetes. American Diabetes Association website. http://www.diabetes.org/advocacy/news-events/cost-of-diabetes.html. Updated June 22, 2015. Accessed March 22, 2017. 6. Mainous AG 3rd, Tanner RJ, Baker R. Prediabetes diagnosis and treatment in primary care. J Am Board Fam Med. 2016;29(2):283-285. 7. Bansal N. Prediabetes diagnosis and treatment: a review. World J Diabetes. 2015;6(2):296-303. 8. Abraham TM, Fox CS. Implications of rising prediabetes prevalence. Diabetes Care. 2013;36(8):2139-2141. 9. James C, Bullard KM, Rolka DB, et al. Implications of alternative definitions of prediabetes for prevalence in U.S. adults. Diabetes Care. 2011;34(2):387-391. 10. American Diabetes Association. Summary of revisions to the 2011 clinical practice recommendations. Diabetes Care. 2011;34(Suppl 1):S3. 11. Mainous AG 3rd, Tanner RJ, Scuderi CB, Porter M, Carke PJ. Prediabetes screening and treatment in diabetes prevention: the impact of physician attitudes. J Am Board Fam Med. 2016;29(6):663-671. 12. Tabák AG, Herder C, Rathmann W, Brunner EJ, Kivimäki M. Prediabetes: a high-risk state for developing diabetes. Lancet. 2012;379(9833):2279-2290. 13. Kiselar JG, Wang X, Dubyak GR, et al. Modification of β-defensin-2 by dicarbonyls methylglyoxal and glyoxal inhibits antibacterial and chemotactic function in vitro. PLoS One. 2015;10(8):e0130533. 14. Long AN, Dagogo-Jack S. The comorbidities of diabetes and hypertension: mechanisms and approach to target organ protection. J Clin Hypertens (Greenwich). 2011;13(4):244-251. 15. Franz MJ, Boucher JL, Evert AB. Evidence-based diabetes nutrition therapy recommendations are effective: the key is individualization. Diabetes Metab Syndr Obes. 2014;7:65-72. 16. Brand-Miller JC, Stockmann K, Atkinson F, Petocz P, Denyer G. Glycemic index, postprandial glycemia, and the shape of the curve in healthy subjects: analysis of a database of more than 1,000 foods. Am J Clin Nutr. 2009;89(1):97-105. 17. Zeevi D, Korem T, Zmora N, et al. Personalized nutrition by prediction of glycemic response. Cell. 2015;163(5):1079-1094. 18. Evert A, Boucher L, Cypress M, Dunbar S, et al. Nutrition therapy recommendations for the management of adults with diabetes. Diabetes Care. 2013;36:3821-3842. 19. Estadella D, da Penha Oller do Nascimento CM, Oyama LM, Ribeiro EB, Dâmoso AR, de Piano A. Lipotoxicity: effects of dietary saturated and transfatty acids. Mediators Inflamm. 2013;2013:137579. 20. Risérus U, Willett WC, Hu FB. Dietary fats and prevention of type 2 diabetes. Prog Lipid Res. 2009;48(1):44-51. 21. US Department of Agriculture, US Department of Health of Human Services. Dietary Guidelines for Americans 2015–2020. https://health.gov/dietaryguidelines/2015/guidelines/. Published January 7, 2016. Accessed April 3, 2017. 22. Salas-Salvadó J, Bulló M, Babio N, et al. Reduction in the Incidence of type 2 diabetes with the Mediterranean diet: results of the PREDIMED-Reus nutrition intervention randomized trial. Diabetes Care. 2011;34(1):14-19. 23. Kahleova H, Matoulek M, Malinska H, et al. Vegetarian diet improves insulin resistance and oxidative stress markers more than conventional diet in subjects with type 2 diabetes. Diabet Med. 2011;28(5):549-559. 24. Salas-Salvadó J, Martinez-González MÁ, Bulló M, Ros E. The role of diet in the prevention of type 2 diabetes. Nutr Metab Cardiovasc Dis. 2011;21(Suppl 2):B32-B48. 25. Maekawa S, Kawahara T, Nomura R, et al. Retrospective study on the efficacy of a low-carbohydrate diet for impaired glucose tolerance. Diabetes Metab Syndr Obes. 2014;7:195-201. 26. Saslow LR, Kim S, Daubenmier JJ, et al. A randomized pilot trial of a moderate carbohydrate diet compared to a very low carbohydrate diet in overweight or obese individuals with type 2 diabetes mellitus or prediabetes. PLoS One. 2014;9(4):e91027. 27. Sweeney TE, Morton JM. The human gut microbiome: a review of the effect of obesity and surgically induced weight loss. JAMA Surg. 2013;148(6):563-569. 28. Busetto L. The timing of bariatric surgery in people with obesity and diabetes. Ann Transl Med. 2015;3(7):94. 29. Khaodhiar L, Cummings S, Apovian CM. Treating diabetes and prediabetes by focusing on obesity management. Curr Diab Rep. 2009;9(5):348-354. 30. Festa A, D'Agostino R Jr, Howard G, Mykkänen L, Tracy RP, Haffner SM. Chronic subclinical inflammation as part of the insulin resistance syndrome. Circulation. 2000;102(1):42-47. 31. Lindström J, Louheranta A, Mannelin M, et al. The Finnish Diabetes Prevention Study (DPS): lifestyle interventions and 3-year results on diet and physical activity. Diabetes Care. 2003;26(12):3230-3236. 32. Ilanne-Parikka P, Laaksonen DE, Eriksson JG, et al. Leisure-time and physical activity and the metabolic syndrome in the Finnish diabetes prevention study. Diabetes Care. 2010;33(7):1610-1617. 33. Physical activity and adults. World Health Organization website. http://www.who.int/dietphysicalactivity/factsheet_adults/en/. Accessed April 5, 2017. 34. Hostalek U, Gwilt M, Hildemann S. Therapeutic use of metformin in prediabetes and diabetes prevention. Drugs. 2015;75(10):1071-1094. 35. Napolitano A, Miller S, Nicholls AW, et al. Novel gut-based pharmacology of metformin in patients with type 2 diabetes mellitus. PLoS One. 2014;9(7):e100778. 36. Davis PA, Yokoyama W. Cinnamon intake lowers fasting blood glucose: a meta-analysis. J Med Food. 2011;14(9):884-889. 37. Wahlqvist ML, Lee MS, Lee JT, et al. Cinnamon users with prediabetes have a better fasting working memory: a cross-sectional functional study. Nutr Res. 2016;36(4):305-310. 38. Hua Y, Clark S, Ren J, Sreejayan N. Molecular mechanisms of chromium in alleviating insulin resistance. J Nutr Biochem. 2012;23(4):313-319. 39. Ali A, Ma Y, Reynolds J, Wise JP, Inzucchi SE, Katz DL. Chromium picolinate for the prevention of type 2 diabetes. Treat Strategies Diabetes. 2011;3(1):34-40. 40. Chromium. National Institutes of Health, Office of Dietary Supplements website. https://ods.od.nih.gov/factsheets/Chromium-HealthProfessional/. Updated November 4, 2013. Accessed April 11, 2017. 41. Wu JH, Micha R, Imamura F, et al. Omega-3 fatty acids and incident type 2 diabetes: a systematic review and meta-analysis. Br J Nutr. 2012;107(Suppl 2):S214-S217. 42. Sala-Vila A, Díaz-López A, Valls-Pedret C, Cofan M, et al. Dietary marine ω-3 fatty acids and incident sight-threatening retinopathy in middle-aged and older individuals with type 2 diabetes: prospective investigation from the PREDIMED Trial. JAMA Ophthalmol. 2016;134(10):1142-1149. 43. Han E, Yun Y, Kim G, et al. Effects of omega-3 fatty acid supplementation on diabetic nephropathy progression in patients with diabetes and hypertriglyceridemia. PLoS One. 2016;11(5):e0154683. 44. Goldibi S, Badran M, Laher I. Diabetes and alpha lipoic acid. Front Pharmacol. 2011;2:69. 45. Parker AR, Byham-Gray L, Denmark R, Winkle PJ. The effect of medical nutrition therapy by a registered dietitian nutritionist in patients with prediabetes participating in randomized controlled clinical research trial. J Acad Nutr Diet. 2014;114(11):1739-1748.